This article was originally published in Independent Australia on 23 January 2015. A 16-minute video of U.S. Senator Sheldon Whitehouse’s speech to Congress is the most sobering evidence yet of the threat to our very existence by the powerful oligarchs behind the apparatus of lies that is the Climate Denial Beast. Deputy editor, Sandi Keanereports. ALL THROUGH 2014, the hottest year on record, a junior U.S. Senator from Rhode Island (Democrat) continued to ramp up the heat on climate deniers. Sheldon Whitehouse has delivered a “scorcher” on climate change in each of the 83 weeks that Congress has been in session since he won the seat in 2007. 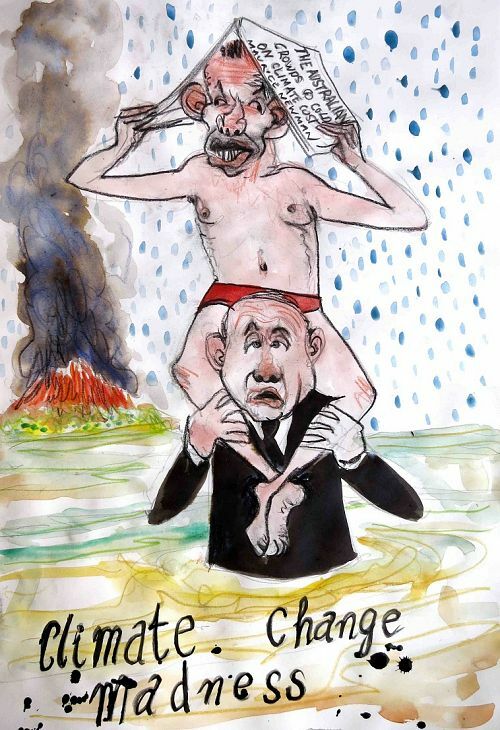 But no speech more relevant to Australia given our own place in the shadowy global denialist web was his dissection of the Climate Denial Beast. Skilfully exposing the entrails of the beast, Whitehouse names its parts: the 91 conservative think tanks (or phoney “front” groups), media outlets, etc. that make up the propaganda machine and the source of the dark money flowing through its veins – the 140-odd “foundations”. Sound familiar? It should. The same beast funded by similar vested interests roams at large here in Australia (led by our own “climate sceptic factory” the Institute of Public Affairs), just as it does in the U.K.
A 16-minute video of Whitehouse’s speech is the most sobering evidence yet of the threat to our very existence by powerful oligarchs. If you watch nothing else this weekend, make sure you watch this and share it around. Independent Australia recommends you also read the transcript below and start applying the blowtorch to our own pollies to stand up to the powerful corporate interests stealing our kids’ futures. ‘I come to the floor today, for the fifty-seventh consecutive week that the Senate has been in session, to urge my colleagues to wake up to what carbon pollution is doing to our atmosphere and oceans. I have described Congress as surrounded by a barricade of lies. Today I’ll be more specific. There isn’t just lying going on about climate change, there’s a whole carefully built apparatus of lies. This apparatus is big, and artfully constructed: phony-baloney organizations designed to look and sound like they’re real; messages honed by public relations experts to sound like they’re truthful; payroll scientists whom polluters can trot out when they need them; and the whole thing big and complicated enough that when you see its parts you could be fooled into thinking it’s not all the same beast. But it is. Just like the mythological Hydra: many heads, same beast. So this speech is going to be about that Beast. A recent research article published by Dr. Robert Brulle, a professor of Sociology and Environmental Science at Drexel University, describes the Beast. He joins a tradition of scholarship in this area, including work by Naomi Oreskes, Aaron McCright, and Riley Dunlap, each of whom has studied the forces behind climate denial; and David Rosner and Gerald Markowitz, who explored chemical and lead industry campaigns to deceive Americans about the dangers of those products. The intricate, interconnected propaganda web and funding network of this climate denial Beast encompasses over one hundred organizations, including industry trade associations, conservative think tanks, and plain old phony front groups for polluter interests. It has even co-opted media outlets, a phenomenon I chronicled in an earlier speech about the Wall Street Journal editorial page becoming the tool of polluter propaganda. This chart from Dr. Brulle’s report shows the complex interconnection of the Beast’s major players. The green diamonds are the big funders: theKoch-affiliated foundations, the Scaife-affiliated foundations, the American Petroleum Institute, and so on. And the blue circles are the who’s-who of climate denial groups: theHeartland Institute (they’re the group that compared folks concerned about climate change to the Unabomber, just to give you a sense of what sort of people they are), the American Enterprise Institute, right here; the Hoover Institution; the Heritage Foundation; the Cato Institute; the Mercatus Center; to name just a few. The purpose of this netwSo let’s take a look at this climate-denial Beast — and how polluter money and dark money flow through its veins. How many $ billions flow through its veins? And big money flows through it: more than half a billion dollars. The Drexel University report chronicles that from 2003 to 2010, 140 foundations made grants totaling $558 million to 91 organizations that actively oppose climate action. It looks like a big Beast to build, just to propagate climate denial. But if you look at carbon emissions from fossil fuels, which in 2011 EPA estimated to be over 5.6 billion metric tons of carbon dioxide. So take 5.6 billion tons of carbon dioxide, and then multiply that by the social cost of carbon, the economic and health costs that the polluters cause and inflict on the rest of society which OMB recently set at thirty-seven dollars per metric ton of CO2. 5.6 billion metric tons of carbon dioxide emitted, $37 per metric ton of CO2, in social cost of carbon, just one year’s emissions will cost roughly 200 billion – with a ‘b’ – dollars. One year’s. So, the stakes are pretty high for the polluters, if they were to pay for the harm that they’re causing. Half a billion dollars – through the Beast – over seven years, to get away with $200 billion of harm every year? It’s a bargain. And more than that, a lot of this machinery was already built. The Beast did not spring up at once, full-grown. It grew, over time, in industry-fuelled campaigns to obscure the dangers of cigarette smoke, of acid rain, of ozone depletion. Who knows; there are probably parts of it that go back to fighting the benefit of requiring seat belts and air bags in cars. Looking back on the effects of these industry-funded campaigns of denial, we see that real people were hurt. But the denial machinery stalled action and made the wrongdoers money. It worked. So now the climate denial machine, the Beast, is calling plays from the same playbook, and even using many of the same front organizations. So who is behind this Beast? Unfortunately for proponents of transparency, a large portion of the funding is not traceable. Much of the money fuelling the Beast is laundered through organizations which exist to conceal donor identity. Some of the organizations examined by Dr. Brulle get over 90 percent of their money from hidden sources. Indeed, more than a third of these organizations get over 90 percent of their money from hidden sources. The biggest identity-laundering shop is Donors Trust and Donors Capital Fund. Indeed, it is by far the biggest source of funding in this web. These twin entities reported giving a combined $78 million to climate denier groups between 2003 and 2010, and they refuse to identify their funders. Interestingly, anonymous funding flowing into the Beast through Donors Trust and Donors Capital Fund has grown in tandem with disclosed funding from fossil fuel polluters declining: anonymous dollars up, disclosed dollars down. As we see here, Donors Trust and Donors Capital donations to the Beast went from 3 per cent of all foundation funding in 2003 to more than 23 per cent in 2010. At the same time, for example, the Koch Brothers’ Affiliated Foundations declined from 9 per cent of all foundation funding in 2006 down to 2 per cent by 2010. And the same is true for other polluter-backed foundations. 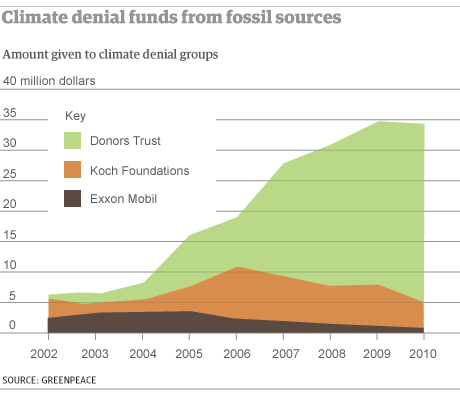 Exxon Mobil Foundation, for instance, wound down its disclosed funding of organizations in the climate denier network and basically zeroed out by 2007. It makes perfect sense. Why would the Koch Brothers and Exxon come under fire for obviously funding climate denial, when Donors Trust and Capital creates a mechanism for polluters to secretly fund the Beast? Plus, the phony baloney front organizations within the Beast, they can pretend that they’re not funded by polluter money. Everybody wins in this identity-laundering scheme, except the public, of course, whom this elaborate construction is designed to fool. The product of this denial apparatus is a complex ruse to delegitimize the science that supports curbing carbon emissions, foisted on the American people with all the financing and fantasy of a Hollywood blockbuster production. Frankly, Madam President, this apparatus is a disgrace. When the inevitable happens, and the impact of climate change really starts to hit home, people will want to know – Americans will want to know, people around the world will want to know – why, why we didn’t take proper steps in time? It’s not as if there isn’t enough scientific evidence out there for us to act. Why not? This denial operation, the Beast, will then go down as one of our great American scandals, like Watergate or Teapot Dome – a deliberate, complex scheme – of lies and propaganda that caused real harm to the American people and to our country, all so that a small group of people could make more money a little longer. It is time for our denier colleagues to turn back, and forswear their foolish ways. If they don’t, there will be a day of reckoning, and a harsh price to pay. Well, we are now in a period of consequences. We have got to break the back of the Beast, and break the barricade of blandishments and lies that Beast has built around Congress. This campaign of denial – this Beast – is as poisonous to our democracy as carbon pollution is to our atmosphere and oceans. With money and lobbyists and threats it has infiltrated itself in an unseemly way into influence in our government. For the sake of our democracy, for the sake of our future, for the sake of our honor, it is time to wake up. You can follow Senator Sheldon Whitehouse on Twitter @SenWhitehouse. You can follow Sandi Keane on Twitter @jarrapin. Want to find out more about the climate denial machine in Australia and who funds it? This entry was posted in Energy, Environment, Politics by skepticslayer. Bookmark the permalink.